Use of Akka relieves you from creating the infrastructure for an actor system and from writing the low-level code necessary to control basic behavior. To appreciate this, let’s look at the relationships between actors you create in your code and those that Akka creates and manages for you internally, the actor lifecycle, and failure handling. An actor in Akka always belongs to a parent. You create an actor by calling getContext().spawn()context.spawn(). The creator actor becomes the parent of the newly created child actor. You might ask then, who is the parent of the first actor you create? 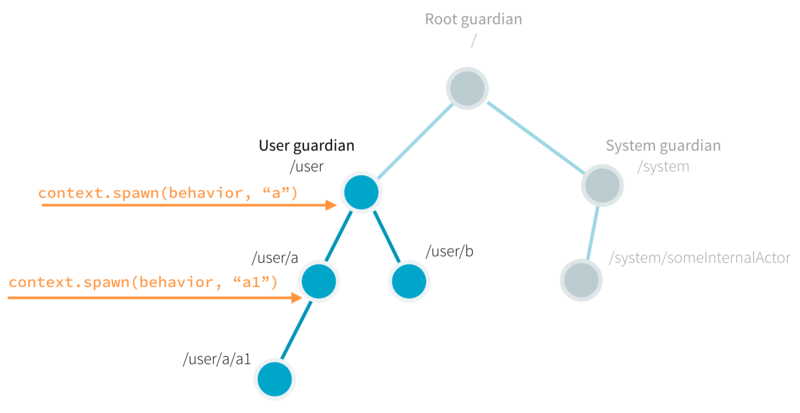 As illustrated below, all actors have a common parent, the user guardian, which is defined and created when you start the ActorSystem. As we covered in the Quickstart GuideQuickstart Guide, creation of an actor returns a reference that is a valid URL. So, for example, if we create an actor named someActor from the user guardian with context.spawn(someBehavior, "someActor"), its reference will include the path /user/someActor. / the so-called root guardian. This is the parent of all actors in the system, and the last one to stop when the system itself is terminated. /user the guardian. This is the parent actor for all user created actors. Don’t let the name user confuse you, it has nothing to do with end users, nor with user handling. Every actor you create using the Akka library will have the constant path /user/ prepended to it. /system the system guardian. Akka or other libraries built on top of Akka may create actors in the system namespace. The easiest way to see the actor hierarchy in action is to print ActorRef instances. In this small experiment, we create an actor, print its reference, create a child of this actor, and print the child’s reference. We start with the Hello World project, if you have not downloaded it, download the Quickstart project from the Lightbend Tech HubLightbend Tech Hub. In your Hello World project, navigate to the com.lightbend.akka.sample package and create a new Scala file called ActorHierarchyExperiments.scalaJava file called ActorHierarchyExperiments.java here. Copy and paste the code from the snippet below to this new source file. Save your file and run sbt "runMain com.lightbend.akka.sample.ActorHierarchyExperiments" to observe the output. Both paths start with akka://testSystem/. Since all actor references are valid URLs, akka:// is the value of the protocol field. Next, just like on the World Wide Web, the URL identifies the system. In this example, the system is named testSystem, but it could be any other name. If remote communication between multiple systems is enabled, this part of the URL includes the hostname so other systems can find it on the network. Because the second actor’s reference includes the path /first-actor/, it identifies it as a child of the first. The last part of the actor reference, #1053618476 or #-1544706041 is a unique identifier that you can ignore in most cases. Now that you understand what the actor hierarchy looks like, you might be wondering: Why do we need this hierarchy? What is it used for? An important role of the hierarchy is to safely manage actor lifecycles. Let’s consider this next and see how that knowledge can help us write better code. Actors pop into existence when created, then later, at user requests, they are stopped. Whenever an actor is stopped, all of its children are recursively stopped too. This behavior greatly simplifies resource cleanup and helps avoid resource leaks such as those caused by open sockets and files. In fact, a commonly overlooked difficulty when dealing with low-level multi-threaded code is the lifecycle management of various concurrent resources. To stop an actor, the recommended pattern is to return Behaviors.stopped() inside the actor to stop itself, usually as a response to some user defined stop message or when the actor is done with its job. Stopping a child actor is technically possible by calling context.stop(childRef) from the parent, but it’s not possible to stop arbitrary (non-child) actors this way. The Akka actor API exposes some lifecycle signals, for example PostStop is sent just before the actor stops. No messages are processed after this point. When we stopped actor first, it stopped its child actor, second, before stopping itself. This ordering is strict, all PostStop signals of the children are processed before the PostStop signal of the parent is processed. Parents and children are connected throughout their lifecycles. Whenever an actor fails (throws an exception or an unhandled exception bubbles out from onMessageReceive) the failure information is propagated to the supervision strategy, which then decides how to handle the exception caused by the actor. The supervision strategy is typically defined by the parent actor when it spawns a child actor. In this way, parents act as supervisors for their children. The default supervisor strategy is to stop the child. If you don’t define the strategy all failures result in a stop. [ERROR] [11/12/2018 12:03:27.171] [ActorHierarchyExperiments-akka.actor.default-dispatcher-2] [akka://ActorHierarchyExperiments/user/supervising-actor/supervised-actor] Supervisor [email protected] saw failure: I failed! We see that after failure the supervised actor is stopped and immediately restarted. We also see a log entry reporting the exception that was handled, in this case, our test exception. In this example we also used the PreRestart signal which is processed before restarts. For the impatient, we also recommend looking into the fault tolerance reference page for more in-depth details. We’ve learned about how Akka manages actors in hierarchies where parents supervise their children and handle exceptions. We saw how to create a very simple actor and child. Next, we’ll apply this knowledge to our example use case by modeling the communication necessary to get information from device actors. Later, we’ll deal with how to manage the actors in groups.